A Coeur d’Alene woman was refused service at a local yogurt shop for bringing her service dog with her. Now she’s taking action, saying the issue is much bigger than this one experience. Kristina Fairchild was asked to leave the business because she couldn’t prove her dog was a service animal. She explained the issue comes down to a lack of education, and businesses need to understand what they can and can’t do when interacting with people with disabilities who use service animals. Kristina and her dog Kangaroo (Roo) are inseparable. But unlike your regular pet and owner relationship, Kristina needs Roo for her medical needs. Kangaroo is a mobility dog. With the dog’s help, Kristina can walk and get up and down easier. Roo goes where Kristina goes. 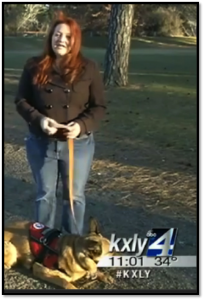 But last week, Kristina says an employee at a Coeur d’Alene business refused Kristina service when she brought Roo inside, questioning whether Roo was a “real” service animal. It’s a problem service dog trainer Charlie Bales also runs into. The Americans with Disabilities Act of 1990 gives rights to both businesses and service dog owners in these types of situations. A business may ask: Is this a service dog? What tasks does the service dog perform? They cannot, however; require special identification for the dog, ask about the person’s disability, refuse admittance, or treat the person less favorably than anyone else. “If I walked into somewhere on crutches or in a wheel chair or with hearing aids and someone said ‘you can’t bring those in here,’ believe it or not, it’s the same thing telling me I can’t take my service dog in,” explained Fairchild. Both Kristina and Charlie said it comes down to a lack of education, something they are working to change.